Fourth-year Sara Kwan, affectionately called “Skwan” by her teammates, has been a leader on and off the turf during her time as a Chicago student-athlete. 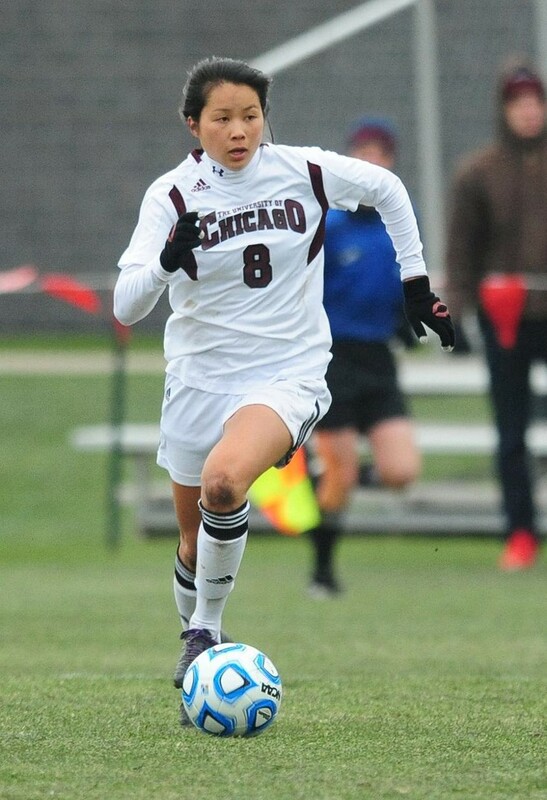 During her four years, Kwan compiled numerous accolades to become one of the most accomplished soccer players in University of Chicago history. In the record books, she ranks eighth in goals with 24, second in assists with 28, and fifth in points with 76. In her senior season, she was named a third-team All-American, first-team All-Central Region, and first-year All-UAA. As captain, she led her young squad to a 15–5–1 record and a Sweet 16 appearance this past season. However, behind every successful college athlete is a lot of hard work and a love for the game. The Irvine, CA native found her passion for soccer at an early age. Kwan quickly set her sights on continuing her athletic career at the collegiate level. Having chosen Chicago for its academic prestige, Kwan certainly took full advantage of her time in the classroom and within the Hyde Park community. She made UAA All-Academic team for three consecutive seasons, and was named to the Scholar All-America team by the National Soccer Coaches Association of America in her final season. As a biology major, Kwan holds two jobs on campus, one working in a lab studying pharmacogenetics and the other in the hospital researching health-care disparities. She is also involved in a Christian club called Christians on Campus. After graduation, Kwan plans on attending a two-year Bible school in California, and then enrolling in graduate school. As her time on the South Side comes to a close, Kwan looks back on her years in maroon and white. Surprisingly, her best memory is the double-overtime loss this season in the Sweet 16 to Illinois Wesleyan that brought her career to an abrupt end. Having embodied all of the values of a Maroon student-athlete during her four years, Kwan leaves her peers with some final words of advice.